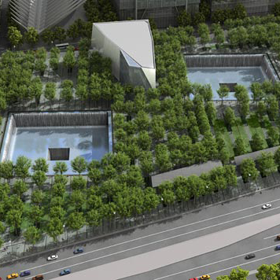 This Memorial consists of two massive pools with waterfalls cascading down their sides, to serve as a powerful reminder of the Twin Towers. The names of those who were killed are inscribed around the edge of the Memorial pools. An eight-acre landscaped Memorial Plaza filled with more than three hundred oak trees creates a contemplative space separate from the sights and sounds of the surrounding city. Complementing the Memorial, a state-of-the art Memorial Museum offers visitors an opportunity to deepen their experience at the site. The Museum has its primary exhibition space below ground, and is accessed through an entry pavilion. July 31, 2012: Bryn meets with an old contact at the World Trade Center Memorial.